Between about 1998 and 2012, a time that coincided with political negotiations for preventing climate change, the surface of Earth seemed hardly to warm. This phenomenon, often termed the ‘global warming hiatus’, caused doubt in the public mind about how well anthropogenic climate change and natural variability are understood. 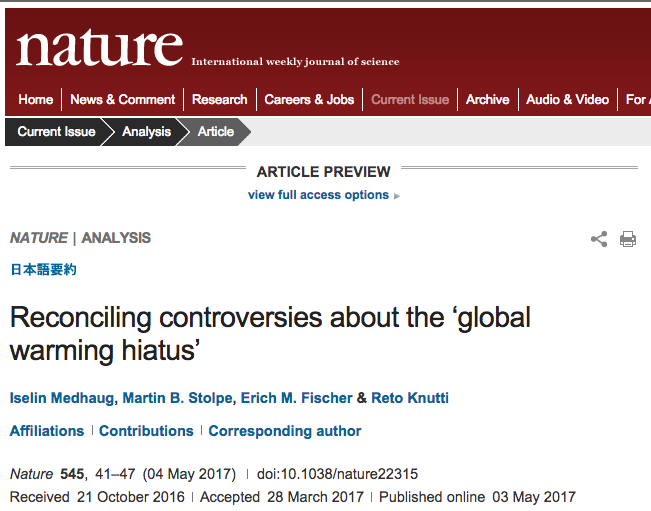 Here we show that apparently contradictory conclusions stem from different definitions of ‘hiatus’ and from different datasets. A combination of changes in forcing, uptake of heat by the oceans, natural variability and incomplete observational coverage reconciles models and data. Combined with stronger recent warming trends in newer datasets, we are now more confident than ever that human influence is dominant in long-term warming. 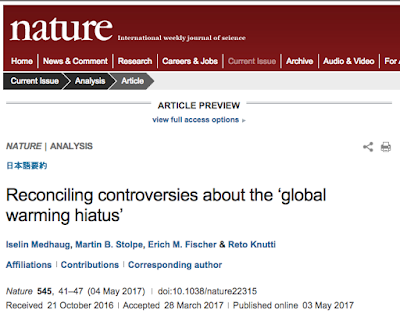 A new paper has been published in the Analysis section of Nature called Reconciling controversies about the ‘global warming hiatus.’ It confirms that the ‘hiatus’ or ‘pause’ is real. It is also rather revealing. It attempts to explain the ‘Pause’ by looking into what is known about climate variability. They say that four years after the release of the IPCC AR5 report, which contained much about the ‘hiatus’ it is time to see what can be learned. One could be a little sarcastic in saying why would Nature devote seven of its desirable pages to an event that some vehemently say never existed and maintain its existence has been disproved long ago. Now, however, as the El Nino spike of the past few years levels off, analysing the ‘pause’ seems to be coming back into fashion. The authors of this recent paper delicately tread a line between the two opposing camps saying, on the one hand, that both sides have a point and their particular methods of analysis are understandable. But on the other hand, they make it clear that there is a real event that needs studying. As someone who has paid close attention to the ‘pause’ for almost a decade, I am perhaps more attentive than most when it comes to a retelling of the history of the idea and the observations. The authors say the pause started with claims from outside the scientific community. Well, yes and no. It was tentatively suggested in 2006 and 2007 by climate sceptics many of whom were experienced scientists and quite capable of reading a graph and calculating statistics. A decade after it was raised, every time the ‘pause’ is debated it is a tribute to those who first noticed it and faced harsh criticism. It was the sceptics who noticed the ‘pause,’ and in doing so made a valuable contribution to science. For years it was only analysed and discussed on the blogosphere before journals took notice. There is nothing new in their recent paper or that hasn’t been discussed by the GWPF. Perhaps that will give pause for thought for some who see battle lines drawn between pause supporters (sceptics) and pause busters (scientists). What the authors miss, with their three definitions of the pause, is a simple fact we have often pointed out. Look at HadCRUT4 from 2001 (after the 1999-2000 El Nino/La Nina event) until 2014 (before the start of the recent El Nino event) and you will see the temperature is flat. Apart from the recent El Nino there has been no global increase since 2001, even though there have been El Ninos and La Ninas in that period. Now that’s what I call a pause. 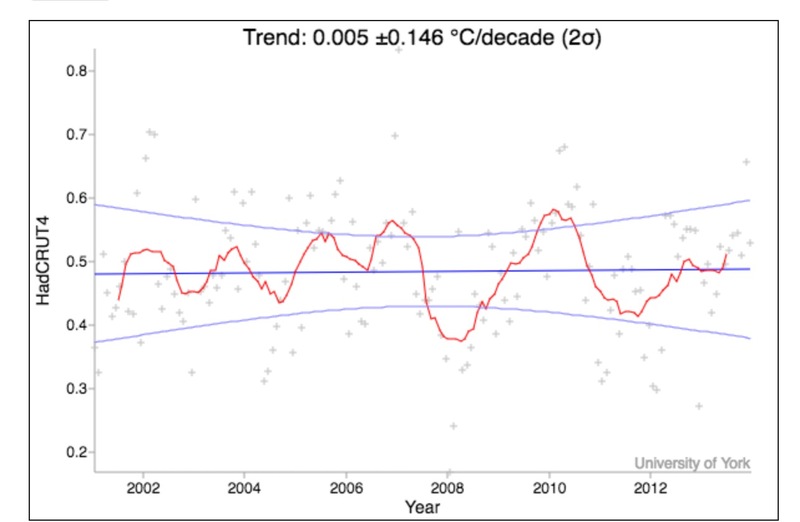 I will leave it to the reader to calculate the trend, and the error of the trend for the same period using other global surface temperature data sets. The duration of the pause is about half of the nominal 30-year basic climate assessment period, so if it resumes in the next few years it may become the dominant climate event of recent times. The pause ended not because of gradual global warming but because of a natural weather event whose temporary increased rate of global warming was far too large to be anthropogenic. 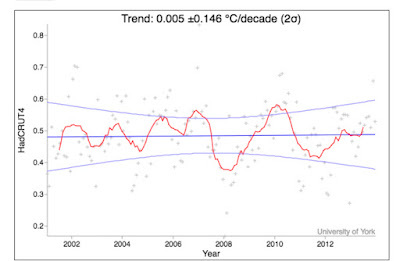 This didn’t stop some from claiming we had entered a period of catastrophic global warming.